So that is one cure. OR a good cure is going to a friend’s house for dinner and girl talk! I went to my friend Star’s house for dinner after work. She is one of the best cooks I know but unfortunately she doesn’t measure or follow recipes when she cooks! I can never recreate her masterpieces because of that. Dinner was vegetarian soup. She made her famous cornbread too. Pour into an iron skillet and top with grated sharp smoked cheese. 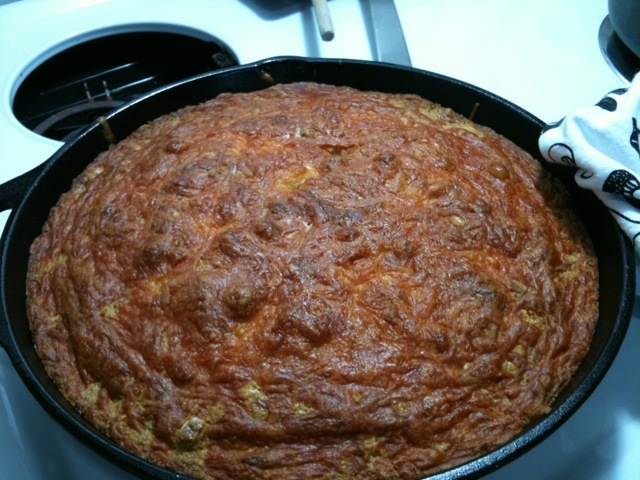 The cheese will sink into the cornbread as it bakes. Bake it according to the package. Delicious! I love her cornbread. Topped with a little melted butter and it’s the perfect side dish. Now for the amazing soup. The night before, she soaked a cup of black beans. With a potato masher, mash the black beans into a puree. Chop a whole sweet onion and a red and yellow pepper. Sautee the veggies in a skillet with garlic and butter. Pour a couple quarts of vegetable broth into a pot. Toss in an entire cube of low fat cream cheese. 1 can of roasted tomatoes (don’t drain liquid) and 1 can of Rotell. 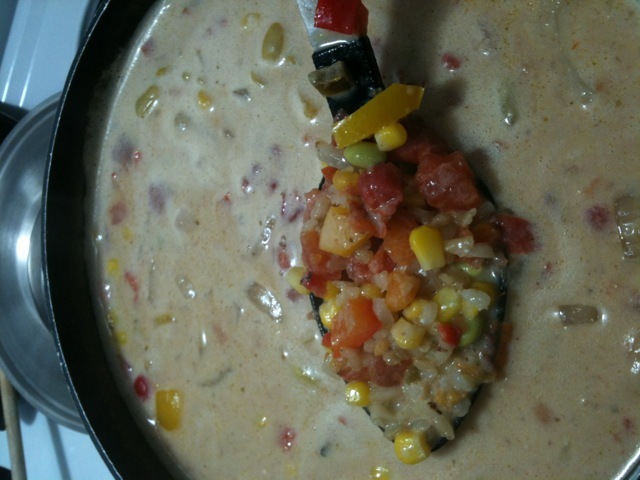 Add frozen corn and frozen soy beans. Add some dry brown rice. It was creamy and delicious. A storm was brewing outside. When I arrived at her house (my old apartment building too) the wind was kicking up and the clouds were threatening rain. A creamy soup was the perfect meal for a rainy night. I got seconds. It was just too good not to. My friend Star had some recent illnesses and she switched to a 90% vegan diet. She looked healthy, happy and has lost some weight. The program she’s doing seems to be working. I don’t know that I could be vegan. I just love dairy too much. Talking with a girlfriend about stress usually makes me feel better. The current situational stressors have been taking a toll. I wish I could say the soup cured me! It didn’t but it did make me feel a little bit better. QUESTION: How do you de-stress? 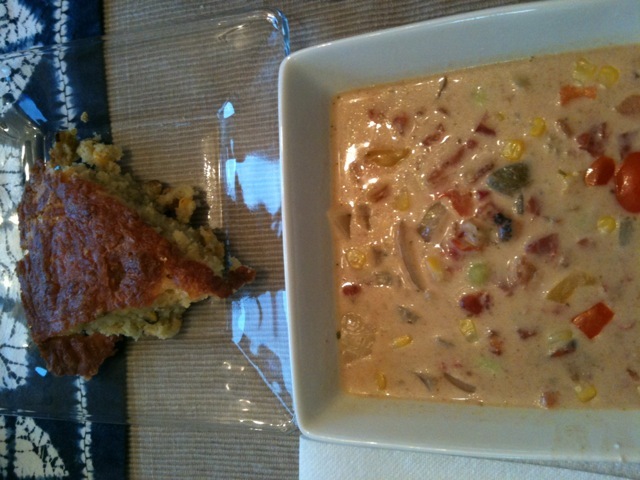 Ohhh cornbread and soup is one of my favorite comfort foods! 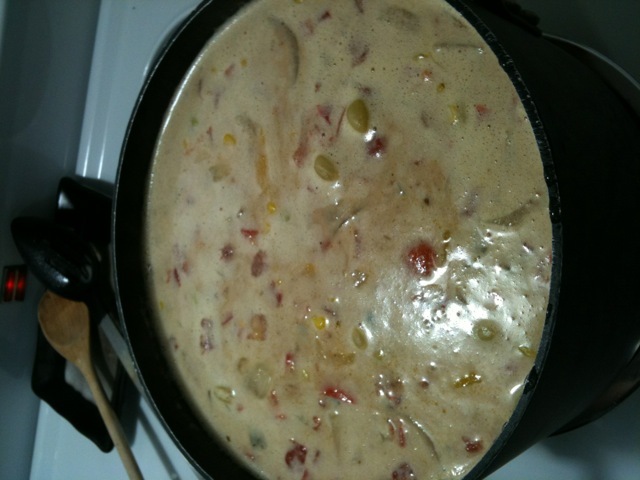 I love the idea of adding a block of cream cheese to make a creamy soup rather than using half a half or heavy cream. Yum!! Just kidding (kinda!). Lately I de-stress by curling up and reading a good book, going for a walk, or taking a nice hot bath. Hanging out with girlfriends is also a great way to relax! You have no idea how amazing it is. I WANT TO COME TO STAR’S HOUSE !! she and I make cornbread almost exactly the same, except Star is a GENIUS to add vanilla ??? That’s so funny you guys make the same cornbread! And yes, there’s always GOOD FOOD at Star’s house!! Vanilla in cornbread eh? That’s pretty interesting! 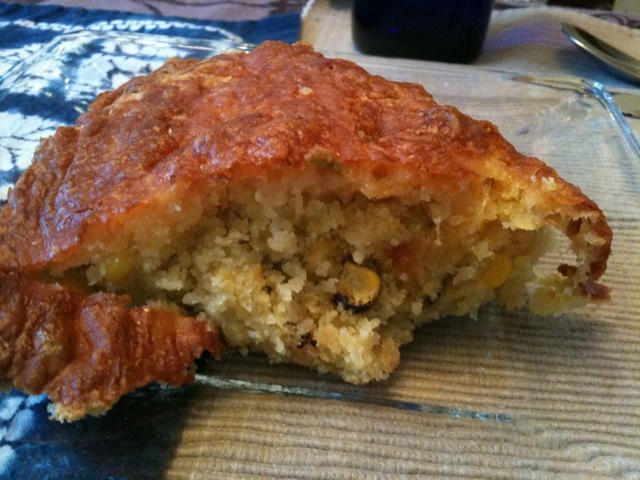 The cornbread is sweet and spicy at the same time. The soup and cornbread look absolutely wonderful. Yum.